Get your bike ready for summer cycling with a bike check this evening near Waterloo. 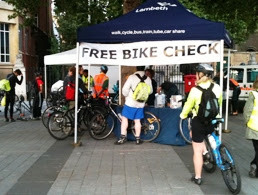 Lambeth Council's Sustainable Transport team will be running a Dr Bike session this Wednesday, 18 June 2014, 5:30-7:30 pm at the Waterloo Roundabout, SE1: at King's College, outside James Clerk Maxwell building, SE1 8WA Come and get your bike checked for free. Qualified bike mechanics will be on hand to give your bike a look over and offer help with adjustments and advice to keep it on the road through the summer. You will also be able to get your bike security marked.